[miau] If you are looking for a video slot game that really pushes the boundaries on thrilling game play, Next Generation Gaming introduces Owl Eyes. The video slot has 5 reels and an impressive 50 pay lines. Unlike many games where you see three lines across the screen, this game gives you 4 lines of play. The theme of the Owl Eyes is all about the creatures of the night, and the stunning graphics do not disappoint. If you are lucky enough to activate the bonus feature, be prepared to see your bankroll explode. Once you enter the dark forest and get ready for play on Owl Eyes, you need to pay close attention for two symbols in particular. The owl is the wild symbol, and in this game it can be stacked three high on one reel. Get a few reels lined up with stacked owls and the winnings are endless. The owls only appear on reels 2,3,4, but can be stacked four high. The next symbol is the moon. This scatter symbol will activate the bonus feature if you can get 3 of them to appear on the screen.The moon symbol is going to trigger the free games feature in Owl Eyes. Three or more moon symbols activate the bonus, but pay close attention to the screen when you have two. As the second moon appears on the spinning reels, the background will chance from a dark forest with fireflies moving about, to a bright full moon that takes up the entire screen. As the remaining reels spin, the moons race by with a glowing tail behind them like a comet. If you luckily get a 3rd moon to appear, the bonus game is activated and you receive 5 free games. Once the bonus game is activated, additional stacked wilds are added. This means that it is nearly impossible to not have a reel full of wild owl symbols during your free 5 games. During the free games, if you get three or more moons, you can retrigger the feature and add 5 more free games to the round. During the bonus round, the winnings will be added to your growing bankroll immediately. The most exciting part of Owl Eyes is the 50 pay lines. This allows you to bet in a wide variety of ways. You have the ability to adjust play by moving the bet amount or the paylines up or down in between each spin of the reels. The smallest bet amount is one cents per line, with the maximum being two dollars per line. The most you can bet on any spin is $100, and at that level if you hit the wild owls that are stacked, your winnings can be substantial. 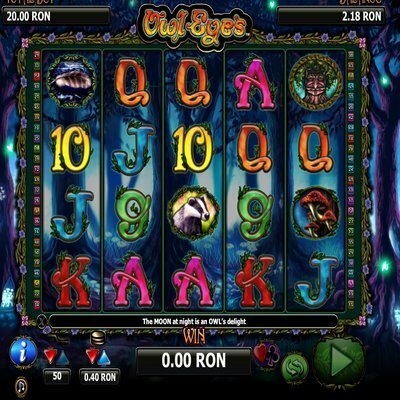 One additional feature to the Owl Eyes video slot game is the gamble feature. After you win on any spin, the gamble feature is activated. Click the gamble button and select the correct color of the card, red or black, and you double your winnings. If you feel like pushing your luck and guessing the suit, you could quadruple your winning with one click of the mouse. The symbols in the game are all dark and creepy, like the little things you expect to see while wandering in the forest at night.